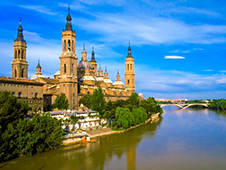 Zaragoza – the capital of the province of Aragon. This compact city is striking splendor of its architecture and traditions. There entwined 5 very different cultures, and each contributes to the wonderful atmosphere of the city. You definitely want to see the symbol of Zaragoza – Cathedral of San Salvador. It is great not only for its size but also the situation inside is also impressive. The best way to see the sights of Zaragoza have a rental car. In 10 km from the town center is located a small international airport of Zaragoza. If you advance to book a car at the airport, he will be waiting for you as soon as the plane landed. Cars will not limited by anything leeway. You can visit Zaragoza and its surroundings at your own pace. Select a car and book it at a good price to help site bookingcar.ru. The rental company you will be asked to show a driver's license of international standard. In addition, to drive a car in Spain can only persons 21 years of driving experience at least a year. audio signals in the city is prohibited. Free parking in Zaragoza almost there - but there are plenty of underground parking, where you can leave the rented car. It is provided as a daily and hourly parking. Payment takes place in the underground parking at the check over the counter. You can settle in cash or by credit card. When choosing a hotel or restaurant and pay attention to the presence of their own free parking. The rate of alcohol in the driver's blood should not exceed 0.5 ppm. To achieve this enough glasses of beer or two glasses of dry wine (total 250 ml). The law is very strict about violation of this rule. Fines, which receive payment drunken drivers twice. If the fine for speeding - 100 euros, the driver who is intoxicated, will pay 200 euros. In addition, for this may deprive the rights for some time. AP-68 Bilbao-Zaragoza (294 km), the fare 32.05 euros. To pay for travel on these routes can be at the end of the path through special machines. They accept both cash and credit cards.